Located close to Port Elizabeth, Addo Elephant National Park is now South Africa’s third largest protected area. Originally created in 1931 for the conservation of only 11 elephants, the park is now home to a burgeoning population of over 600 as well as a large variety of other species. The park has recently been expanded and now incorporates the Wood Cape Nature Reserve and the adjoining marine reserve, offering the chance to spot sea life as well as land-based fauna. While perhaps not as spectacular as some South Africa’s other national parks in terms of wildlife, the Big Five are all present. The park is best known for the eponymous elephants but it is also possible to spot Transvaal lions, rare black rhinos and many more. Since the park now includes the neighbouring marine park, it is also the only place in the world where you can see all of Africa’s ‘big seven’ — the traditional Big Five plus southern right whales and great white sharks — all in one place. The park has some particularly lovely forested areas where some of the accommodation is located, offering a peaceful stay, close to nature. The large park includes a range of varied landscapes and diverse ecosystems. Addo features a network of tarred and gravelled roads for self-drive exploration. There are also hiking trails where visitors can head into the bush to explore on foot. However, there is limited scope for driving into the wilderness away from the roads. The main activity is self-drive safaris. There are three tarred roads suitable for any type of car and the rest are gravelled. This network of roads gives visitors the chance to head into the park in search of wildlife in a reserve that is less busy than more popular safari destinations. The most famous animal in the park are the elephants, and the population is now one of the densest to be found anywhere in the world, but the park is also home to many other interesting species. Guided game drives are also available. Experienced guides help visitors spot some of the park’s more elusive residents and this activity is available at several times during the day, including sunrise, sunset and after dark. It is also possible to hire a guide for your car on your self-drive explorations. A number of other activities are possible in the park. Guided tours on horseback through Big Five areas are available for those with riding experience. The maximum number of participants is seven per trip. Horse riding is not available to visitors under 16. If the idea of riding a horse through lion territory does not appeal, there is a self-drive 4x4 trail that takes around six hours to drive. If, on the other hand, you want to get as close to nature as possible, several hiking trails exist, including the overnight Alexandria Trail. Shorter walks of one or three hours are available with no charge. Finally, marine eco-tours of the adjoining marine park are possible, giving participants the chance to spot southern right whales and great white sharks. 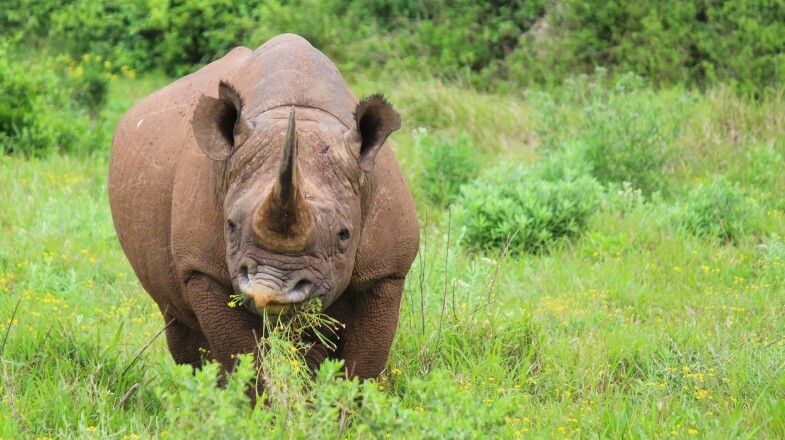 These tours are run from Port Elizabeth and not actually from within Addo itself. The climate is arid year-round, meaning game viewing is good in any season since animals are drawn to waterholes throughout the year. June to September is the driest period, making this the best period for spotting wildlife — but this also coincides with South Africa’s winter and mornings and evenings can be chilly. The park is open to day visitors and it is possible to spend just one day in the park searching for some of the star wildlife attractions that are found there. If you want to incorporate the marine park with a safari, then there are many one-day tours available from Port Elizabeth. However, a stay of at least three days would allow you to partake in some of the other activities on offer as well as giving you time to appreciate the park more fully. The park’s main accommodation is the Addo Rest Camp. The camp has a range of accommodation types, including cottages, chalets, rondavels, cabins, safari tents and facilities for caravanning and camping. The camp also boasts a swimming pool, restaurant and shop. One unique feature is a floodlit waterhole where visitors can watch animals come to drink. There are three other rest camps and one bush camp. The much smaller Matyholweni Rest Camp has one cottage and one family cottage. Nyathi Rest Camp offers stylish huts in a secluded location with large viewing windows and individual splash pools. Spekboom Tented Rest Camp includes five tents, each with two beds. Narina Bush Camp is situated in a serene forest location and provides tented accommodation for up to eight people. It must be booked as one unit. It is not located in Big Five territory. Other than the rest camps, accommodation is available in the Alexandria Forest in the Wood Cape Reserve area of the park. There is also one cottage in the Kabouga area. Finally, the most luxurious option is to stay in one of the three privately-run five-star luxury camps. Gorah Elephant Camp offers high-end tented accommodation, River Bend Lodge has eight room plus one luxury villa and Kazuko Lodge offers 24 chalets. The park is home to the world’s largest population of flightless dung beetles. Since they are protected, you should take care not to step on them or run them over with your car! There is a picnic and braai area for day visitors. There is no public transport to the park but cars can be rented in Port Elizabeth. The park is a malaria-free zone. 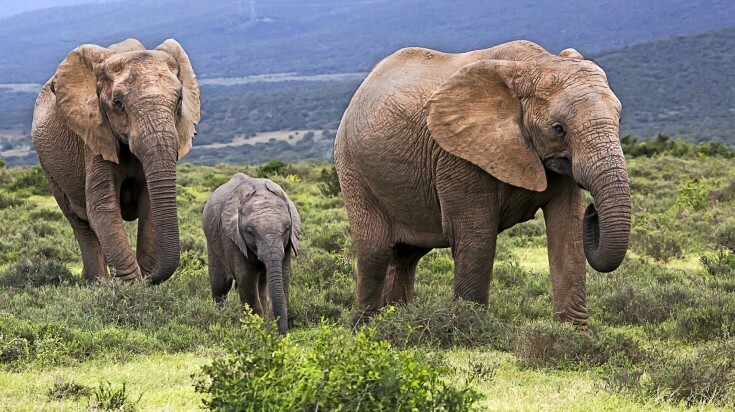 Addo Elephant National Park does not have the star appeal of places like Kruger or the dramatic landscapes of somewhere like Kgalagadi but it does offer the chance for some decent wildlife watching in a setting with fewer other tourists. For those who prefer a more understated and peaceful experience, a safari in Addo could be a wise choice.